As a guide of countless tours around the PAL&G labyrinth, meditation gardens, and historical mansion, I’ve yet to figure out the magic of the place. Always a pleasure though to watch shoulders relax and smiles emerge after a dip in the verdant meditation gardens. No matter the mood, songbirds soften my rough edges, too. Our Australian visitors say I’ve got a “stickybeak.” (Nosy in American English.) I’m fascinated by travelers who are drawn to PAL&G hours before they fly home. Like a mother/son team who love their English labyrinths. They stumbled last minute into our Chartres Cathedral-inspired creation. Another women from Hawaii was en route to Finland. She was wilting in the shade waiting for the 3 p.m. tour. She may have questioned her choice of spending her layover at PAL&G. Sixty minutes later her body language said something else. Shoulders slightly stooped, deep in contemplation while ambling the eleven concentric labyrinth circles, her posture straightened as she emerged. No elixir did she slip from her purse. Only the willingness to open to Spirit is my guess. When feeling like Mr. Shakespeare’s Hamlet (in Act 1, Scene 2), “O God, O God, how weary, stale, flat, and unprofitable seem to me all the uses of this world!” Run; don’t walk to the PAL&G labyrinth. (All right, walk briskly. Don’t want you slipping into the gorgeous reflecting pools.) Peace can occur when a prayer of surrender is said before twisting and winding through the labyrinth. That’s what someone very close whispered in my ear anyway. If you’re a flexible type, or a yogi or yogini-in-training, check out Yoga at the Labyrinth. Or if you prefer an er, um less bendy approach, click the Visit tab at PeaceLabyrinth.org. Dare to explore the beautiful environment inside and outside of you. Los Angeles is ablaze in a fiery heat wave. Tempers can flare as temperatures rise. Escape to air conditioned theatres featuring superheroes is one option. But what if others have the same idea and all seats are taken? Dive inside and discover the superhero in you. (By all means, take a cold shower; soak in an ice cube bath, whatever it takes to feel relief before taking the inner trek to claim your superpower.) Yes, I’m suggesting the free and powerful tool of meditation. The only kryptonite you’ll likely encounter are past hurts. But if you chant HU, the ancient Sanskrit name of God, you may experience a soothing balm. And a restoration of super you! When Ani – pronounced “ah-nigh” – the tone of empathy is combined with HU - pronounced "hugh" - magic truly happens. You may have to resist fidget fairies the first few times. But chanting Ani-HU will eventually steamroller away irritations. Maybe you already have a favorite mantra. Great! Or perhaps closing your eyes – unless it’s sleep – is just not your thing. Are you willing to breathe? I’m not joking. By altering how we’re taking in air, we can better control our emotions. Check out this short and charming YouTube. What Is Soul Awareness?, August 7, 2018 at 7:30 p.m.
3500 West Adams Blvd. LA CA 90019. All the accolades are deserved. The labyrinth, the gardens and Italian renaissance villa are magnificent. So are many of the people who live and work at PAL&G. Scientists say that even faking a smile can reduce stress and increase serenity. Smiling at those around you can also apparently improve the energetic of an environment. George’s easy smile sometimes makes this writer wonder if he’s strategizing mischief. His baby blues are brightest though when swing dancing or singing Sinatra tunes. “I feel a lot of spirit when I dance the big bands – like Glenn Miller,” says George. The melody of the song is a distinctively lilting George Scott ditty. However, any light tune will apparently do the trick. “The important thing is the (affirmation of) I am,” says George. I am grateful for PAL&G’s song-and-dance man. Every little cell in my body is healthy. I’m so glad every little cell in my body is healthy and well. Jack maintains that areas surrounding the labyrinth reflect consciousness. He sees the reflecting pool as a symbol of the unconscious; the pergola crowned by Madame Butterfly, the kingdom of emotions. And the Asian accented gardens? A foray into fantasy/imagination and the physical world. With all its ways of awakening awareness, Jack believes the labyrinth is reflective of the mental realm. Inspired by Jack, I took a turn in the labyrinth. After saying a prayer at the entrance, I solemnly stepped and silently chanted HU (the ancient Sanskrit name for God.) Looking up, a fat chipmunk was furiously swishing his tail. He seemed intent on capturing a nut or some sort of morsel. I laughed. He reminded me of my tabby cat. The ice cream truck music decided just then to serenade me with It’s A Small World. I stepped off the labyrinth feeling lighter. No brilliant formulas. But some say joy is synonymous with soul. Wouldn’t it be wonderful though to know how truly, truly divine you are? Better than any Porsche or Jimmy Choo shoes! HERE ARE TWO NEW YEAR'S EVENTS. Embrace all that is great and holy. Let go of 2017. Welcome in a shiny Light and Love filled 2018. That second cup of coffee calls. I take an extra gulp of fresh air instead. Amazing how breathing can bring balance. We’ve all heard the statistics about meditation, right? Hitting the snooze button on our goals seems so counter-intuitive. Yet, the sacred moments taken to listen to our hearts pays off. The mind clears. Inspiration increases. The monkey mind stops chattering. All right, not completely sometimes. But meditation – concentrating on the breath – allows in an intention for peace. And miracles! Countless are the times, a divine idea warrior has vanquished the worrywart in my mind when I surrendered to meditation. Practice, practice, practice may get you into Carnegie Hall. Repeating mantras like Ani-Hu2 may, however, get you into Heaven! As a beginner, sitting for 15 minutes was excruciating. (Bravo if you are a longtime meditation student and this was not your experience. Maybe you’re a saint.) Meditation is a lifeline to sanity. Nature is another soother of frayed nerves. Studies at University of Michigan found a stroll with Mother Nature improves short-term memory. Japanese scientists discovered that forest bathing (shinrin-yoku) brings stress levels down and boosts the immune system. Angelenos may not always have the luxury to run away to Walden Pond (like Henry David Thoreau.) A mini escape is possible. 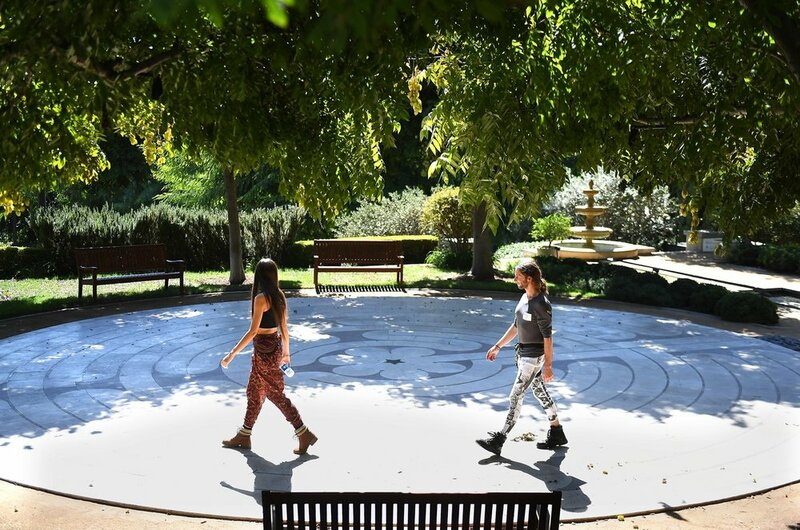 In the heart of the City of Angels, we have Peace Awareness Labyrinth & Gardens. Fountains sing serenity, butterflies kiss flowers in towering bamboo groves. On Tuesday evenings, the Italian Renaissance Villa on the property plays host to events such as an Introduction to Sound & Meditation and Sacred Mysteries of the Labyrinth. Put the coffee down. Give yourself a real break. 2. Ani is a tone of empathy. Hu is the ancient Sanskrit name for God. September 21 is the U.N. International Day of Peace. Peace Awareness Labyrinth & Gardens, together with the Institute for Individual and World Peace took part in celebrating and honoring this day with several events. We started with a Peace Concert, listening to the exquisite, healing music of Merrill Collins, global peace song finalist. Her music swept us away with her beautiful, healing sounds. What a perfect way to help put our bodies, minds, emotions, and our spirit into peace. We followed with an Acceptance and Peace Seminar. Many say the way to world peace is through individual peace. Using this principle, we came together to explore how to come to greater inner peace by simply accepting what is. 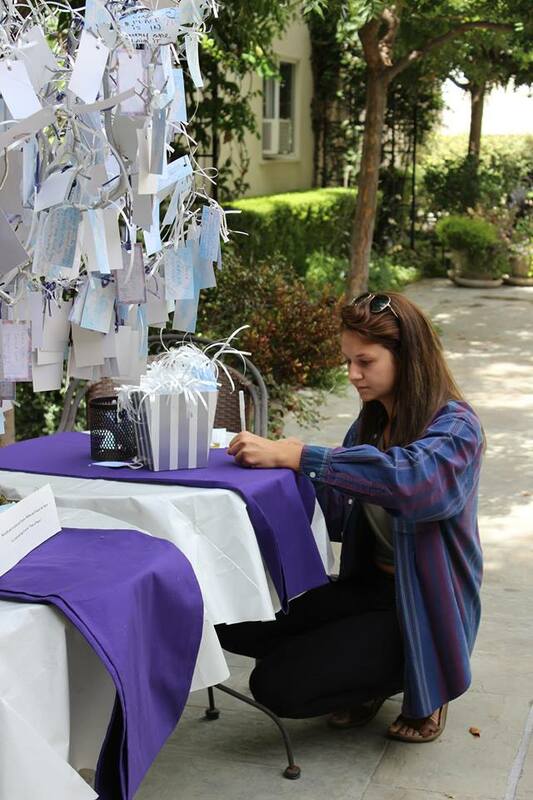 Lastly, we moved forward into celebration and action with a Peace Day Open House. We celebrated by sharing refreshments, music, taking fun "selfies," and with getting to know new people. We shared our love, togetherness, oneness, and our common purpose of wanting to create a better world internally and externally for ourselves, others, our planet. We moved into action by placing our peace intentions and "blessings" at the Labyrinth, the Peace Pole, the Peace Tree. Many shared their photos on their social sites - spreading peace intentions into the world. At 12 noon we participated in the U.N. Global Minute of Peace/Moment of Silence. Paul Kaye, President of MSIA and Peace Awareness Labyrinth & Gardens, led these moments as we all circled around the labyrinth. He spoke a bit about what is peace and what we can do to create peace. Lastly, we took it inward again, to what many call our "Source" by attending Peace Sound Meditations led by Paul Kaye. Paul sounded chimes, singing bowls and meditative instruments, and played guided meditations by John-Roger. These meditations assist us to attune more deeply to where many believe it all begins, within. As someone said, "Peace begins with you." Paul Kaye mentioned some points for how to create peace. Peace is an inner process. Peace is the cessation of againstness. Peace is a choice regardless of circumstances.